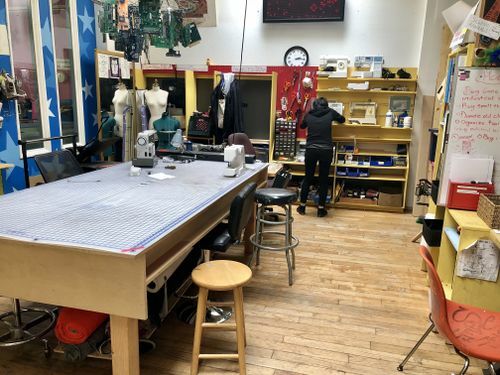 Noisebridge's sewing guild hosts sewing events and maintains five mostly functional sewing machines and a variety of sewing tools. In early 2019, we had a “Sewing Machine Fix-a-Thon” in which we serviced some of our sewing machines and determined what parts needed to be ordered. All sewing machines have QR codes on them that link to their entries on this page. Please use them. Please DO NOT unthread the sewing machines unless you must. (e.g. to remove a spool of thread, simply cut it close to the spool so that the next person can simply tie a knot with the next thread and pull it all the way through to the needle). This is most important for the serger. Needles, bobbins, and other parts are located in labeled drawers underneath the pegboard (PLEASE KEEP IT ORGANIZED). Also check the drawers attached to each sewing machine table. The closest place to get parts is at Apparel City, on Howard between 11th & 12th. Needles may differ between machines and come in sizes (10, 11, 12, 14, 16, etc.). The higher numbers are heavier gauge needles suitable for thicker fabrics. Jersey: Has a ball point, for knitted fabrics (including T-shirt fabric). “Universal”: Moderately sharp, for most woven fabrics. Denim needles are the same but more rigid, for tighter weaves of thick yarns (like denim or canvas). Microtex needles are the sharpest, for tight weaves of thin yarns, like microsuede or nylon. Leather needles have a tiny blade at the tip, for cutting holes in leather and vinyl. Don't use a leather needle for woven or knitted fabrics: The blade will cut the threads rather than squeezing between them, leaving holes that may start rips. Needles for the straight stitch machines must be inserted with the scarf facing right. Please check the respective manuals. If you've never operated a sewing machine before, ask some people at Noisebridge (Kyle or Ely). Sewing machines are not self-explanatory and this page does assume a certain amount of prior general knowledge. Read the manual and do some research online. Use scraps for testing to determine thread tension and sewing speed. What is a thread wiper? To wind a bobbin, place the empty bobbin on the horizontal spindle to the right of the machine body (near the hand wheel). Run a second thread through the upper holder, down to the tensioner at the back of the right side of the machine, in line with the spindle. Thread the end through one of the holes in the bobbin side, from the inside to the outside. Press the lever to push the spindle down in contact with the sewing machine belt. While holding the thread end so it doesn't just whip out of the bobbin, press the pedal to run a couple of inches (if there were fabric in the machine). Soon enough you can let go of the thread end as it will have been caught by windings on top of it. If you are doing a lot of sewing, you can start a new bobbin before the current one is empty, and let it wind up as you sew. When the bobbin is full, the lever will automatically snap out away from the belt and stop winding thread. The bobbin winder is usually on the top of the machine near the right corner (right being the side with the handwheel). It should look like a short spindle that can't be removed and sticks up about half an inch (the thickness of a bobbin) from a flat round surface. On the big Singer machine, the handwheel has a part that flips up to engage the bobbin-winder. On the Brother machines, the bobbin spindle can be slid between the left (sewing) and right (winding). In the latter position, a brake slightly intersects the bobbin and will stop it from getting over-wound. Once the machine is in winding mode and is powered on, press the pedal slightly and make sure thread is going onto the bobbin properly. Once it's winding properly, floor the pedal until the bobbin is fully wound (some machines will stop the bobbin automatically; others may require you to pay attention). Remember to switch the machine back to sewing mode when you're done winding bobbins!!! If a sewing machine is actually broken and non functional, as opposed to just you can't figure out how to make it work, please call Billy from Apparel City at 415-816-8645 (mobile) and schedule an appointment for him to come fix it. He usually charges around $80 per hour, plus parts. Email the list and people will chip in to cover this. If you can't manage this process, email the sewing list and find someone else who can. Also, please put a note on the machine so people know what is going on with it. Juki Maintenance Notes - Replacing the counter knife, needle bar, thread guides, etc. These were originally written for our old DDL-5550-6 machine but the 227 is very similar. General fabrics, light-weight materials and medium weight materials. Not for leather or book binding. Please use the right tool for the job. This is a high tension machine. You must press the knee lifter to pull thread through. This will release the tension. Conversely, DO NOT run into the knee lifter at all while sewing. This will release the tension and your stitches will be too loose. Does Not Work as of 2019-03-09: The machine sews but does not cut well. This machine will be serviced professionally. Pulling fabric out of the machine may cause thread breaks. It is best to feed thread with the pedal when removing your workpiece. DO NOT UNTHREAD THE SERGER. It takes about 30 minutes and a lot of patience to thread this machine. However, if you are an experience user of industrial sergers you will be able to thread this machine quickly. Using tweezers helps. Also, using the correct thread for the correct machine is essential. Good Luck and happy sewing. This machine is not made for knits. It is made for wovens. It is a five spool. It has a clutch motor and this is the reason that it goes so very rapidly. The overlock sews to prevent fray. However, the machine make a chain stitch at the same time. For example, if you were to look inside of your jeans, you can observe these methods. A chain stitch and overlock. This type of machines is used for medium weight fabric. This machine has a knife placed to cut the fabric as you sew, and it *is possible* to cut your finger badly on this knife if you are not careful. BE CAREFUL. This machine also can go extremely, sometimes startlingly, fast. This machine is awesome, and can do many different stitches as well as CNC embroidery. It's usually stored on the wall of the sewing area. It looks like a home sewing machine but is as expensive as an industrial one and is many people's favorite machine. This machine is stored away in one of the sewing area cubbies. This machine does 130 different stitches including lots of cool decorative flowers and patterns. It is also the only machine that can do a zig-zag stitch. Spanish copy located on bookshelf in grey binder. This machine has a bobbin case, so it requires a little bit more knowledge to change out the bobbin than newer machines that have a top drop-in bobbin. This is a four-thread overlock machine. It's evidently meant for knitted fabrics, as a silkscreened note on the upper-left of the front of the machine notes that it requires a Singer 2045 needle, which is a ball point. The thread guides above the machine are on a pole that telescopes out. Make sure to raise it before using the machine; it works better that way. The sewing station includes a variety of scissors, including straight scissors/shears, a pair of pinking shears, and a couple other specialty scissors. DO NOT USE FABRIC SCISSORS FOR ANYTHING THAT ISN'T FABRIC. Paper and other non-fabric things will rapidly dull blades to the point where we need to sharpen them again to use them on fabric. There are some “paper only” (i.e., pre-ruined) scissors on the tools wall since we know people will look in the sewing section for scissors. There are also some “fabric only” (i.e., not yet ruined) scissors that should only ever be used for fabric. Also related: There is a sharpening stone on the tools wall in the sewing station. Thread snips are the small scissor-like tools used for cutting the thread sticking out of a work so you can remove the work from the machine. Thread snips shouldn't be used to cut fabric—use the fabric shears (scissors) or rotary cutters for that. Neither should they be used on non-fabric things like paper or tape. There are three pairs of thread snips hanging from the tools wall in the sewing section. These look similar to pizza cutters but are NOT FOR FOOD USE (both because it trashes the blade and because the blades are not food-safe: new blades are coated in machine oil). All of our rotary cutters are 45mm, except for one, which is 60mm but has no blade. It's unclear whether we'll keep that one, since we would need to keep 60mm blades in stock and that would mean figuring out where to keep them and what to use them for. Each rotary cutter has a cutting (blade extended) position and a safe (blade retracted) position. The Olfa ergonomic cutters will also spring back to retracted automatically, and can't be extended unless the safety button is pushed to the unlocked side. Rotary cutters should be used on a cutting mat such as the one on the main sewing station table. Usually you want a straight cut, so you should use an acrylic ruler to guide the blade. Rotary cutters are EXTREMELY sharp, so be careful. Please keep the cutter blade-side-up so it's less likely to come into accidental contact with the table or anything on it—if you can see the blade, you can avoid contact with it. Keep your body (including fingers) out of the path of the blade. Only use a sharp blade. Don't use a rotary cutter with a dull or trashed blade. Change out the blade if you have to. Don't force it to cut if it's not cutting. Rotary cutters are mostly pretty foolproof. As long as you don't cut yourself, your ruler, wood, another rotary cutter, a 1973 Oldsmobile, or anything else that isn't fabric, the blade should enjoy a good, long life. But, every blade wears down eventually. Blade sharpeners exist, but we don't currently have one, and a sharpener can't save a chipped or bent blade. If a blade can't be sharpened, there are new 45mm blades in the storage drawers along the wall. You should try to keep all of the parts (including those not listed—some cutters do have some bonus parts) in the correct order. If you get the order wrong, the blade might not spin freely or it might be too far from the cutter body. If that's the case, no biggie, just disassemble and try again. Remove the nut by hand, keeping your thumb on the hub/screw on the other side. Gently turn the cutter over and let the blade fall out onto your fingers, and any other parts onto the table. Sharpen or replace the blade. Put the blade onto the screw. Put the screw (with blade) into the cutter, and put all of the other parts, ending with the nut, onto the other side. Needs a 6V 1.2A negative-outer power supply. (Janome #525808008 is the authentic power supply for this model.) We have a wall-wart in the wall-warts bin that's *almost* right, except it's 1.5A, and the Kenmore just runs full-bore with that supply plugged in, regardless of any pedal that may or may not be plugged in. Needs a bobbin case cover. 2008: Noisebridge began having sewing machines at 83c. 2009: Rachel purchased industrial sewing machines from the sewing shop that formerly occupied Noisebridge's 2169 space with member donations and held its first Sewing Workshop at 2169. 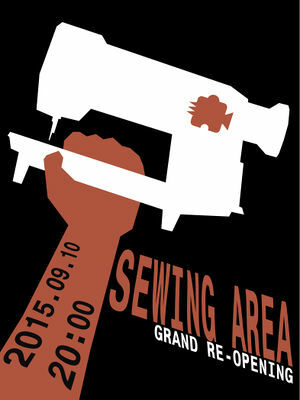 2015: Grand reopening event of the rebooted Sewing Station. This page was last edited on 24 March 2019, at 02:17.